Maya Necklace. Megan Auman. Blackened Steel and Sterling. Line is the simplest element of design. It should not, however, be dismissed as boring. Line is filled with possibility. Just ask any kid with a crayon. Proof of this is in Megan Auman’s “Maya Necklace,” made of sterling and blackened steel wire. Created from interlocking, tear-shaped links, the work is a great study in the use of line: line to create value, form, movement, and visual weight. When working with a pencil, a thicker line equals darker value. Although Auman has used wire of all the same gauge, that is disguised by the way she layers the links. The value appears darker where she has used several links together—like lines in a doodle that are scribbled over will look darker. Single steel links look lighter in value, and where the silver and blackened steel links are jumbled, the value becomes distinctly gray. This is all punctuated by the simple silver links—the lightest value of all. The loose connections between the links create actual movement, of course. 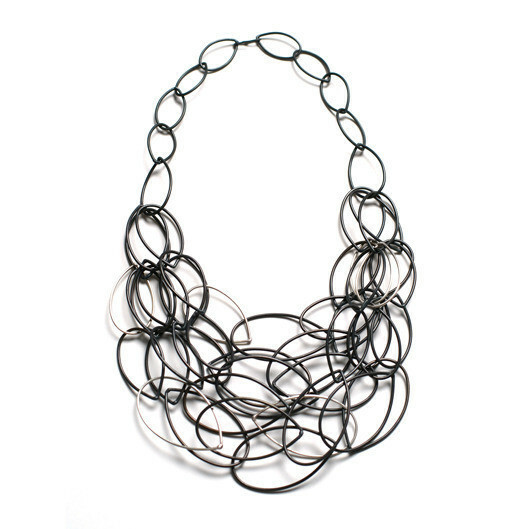 However, by varying the way the links are joined, and by overlapping layers of wire, Auman creates a playful, scribble quality that gives the necklace high visual energy. Even if the links did not actually move, the necklace looks like it’s in motion. The randomness keeps the eye moving, too, always looking for the next area of interest. One of the neatest tricks of “Maya Necklace” is how Auman uses a simple, lightweight material, combined with the open interior of the links, to create a feeling of volume and form. 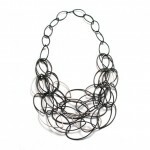 Our mind sees the outline of the total shape of the necklace, and says, “Hmmm. Big shape. Must equal big weight.” So our brain assigns the piece the piece more substance that it actually has. This is the kind of thing that is especially useful for jewelry artists who might want to work in an expensive material without a lot of expense. You can create a statement piece with a minimum of materials. Value, form, movement, playfulness, substance—all with a simple line. Maybe not so simple after all.